“At Mathew’s Café & Deli we do try to do our bit and so are selecting suppliers… who share the same beliefs and ethics as us. I have been in for lunch quite a few times now, and to be honest you are doing pretty well and something very right if you get me back time and time again, as I spend more time eating somewhere new more often than not. 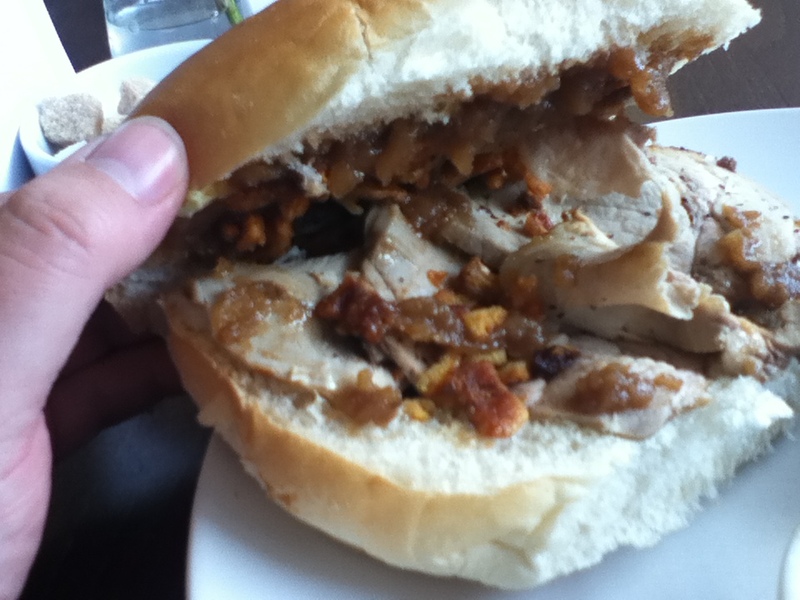 One of the main reasons for my continued lunchtime presence at Matthew’s is their Roast Pork sandwich. It really is one of the best ones I have eaten in the South of this county. It is so good that I have eaten it 3 times out of 4 trips, and I have encouraged family member and friends to also come here specifically to partake of this sandwich and they all without fail have concurred with my thoughts. 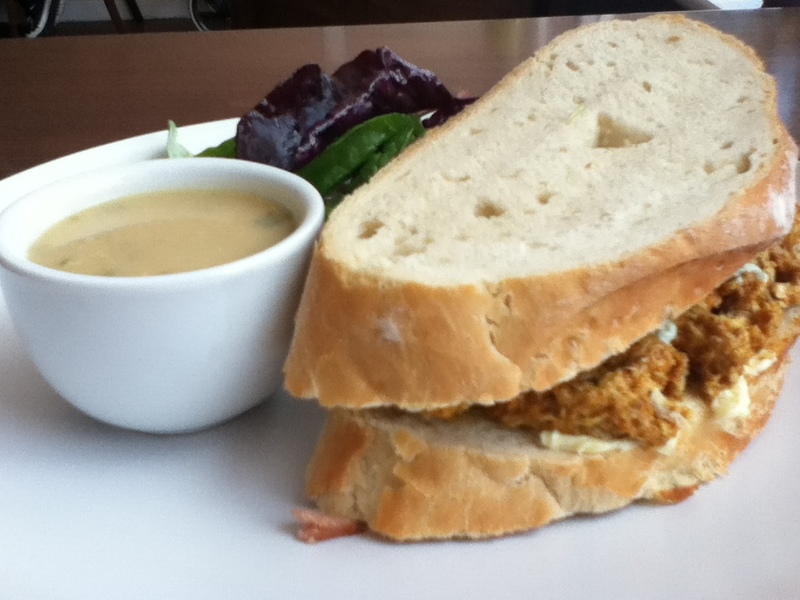 The sandwich is so good due to the combination of its principal ingredients; Roast Pork, Sage and Onion Stuffing, Spiced Apple Sauce and Crispy Crackling. Often when I have eaten this elsewhere one or more of those components will let the side down, but not here, oh no these guys are all working together to create an amazing flavor and taste sensation with each mouthful. The pork is good, moist juicy, tender and most importantly it is plentiful. The sage and onion stuffing has a good strong presence on the palate, it is well flavoured and also moist. The two elements that really elevate the sandwich are the two that often let it down elsewhere. The spice apple sauce is really delightful, it has the same sort of taste as you might get with a mulled wine, or with Christmas cake, something like that. There is just enough in there to elevate and not too much to overpower. It is a world away from that stuff out of a jar that often gets added to your pork cob or sandwich. The second great addition to the bite is the crunch that you get from the crispy crackling pieces. It was crisped up so well that you could eat it without breaking your teeth, a little bit like the texture that you get from a bag of pork scratchings. Perhaps by now you can see that I am quite enamoured with this particular sandwich. Add to that the fact that you get a really nice little green side salad, and a small cup of home made soup all for just £3.90 if you eat in, and you are also getting a real bargain. I would happily be paying £6.50 for this sandwich, but the fact that I am not means that I was able to buy some of their pastry items to take away. The first pastry item, of which I was unable to resist temptation, was their home made sausage rolls. 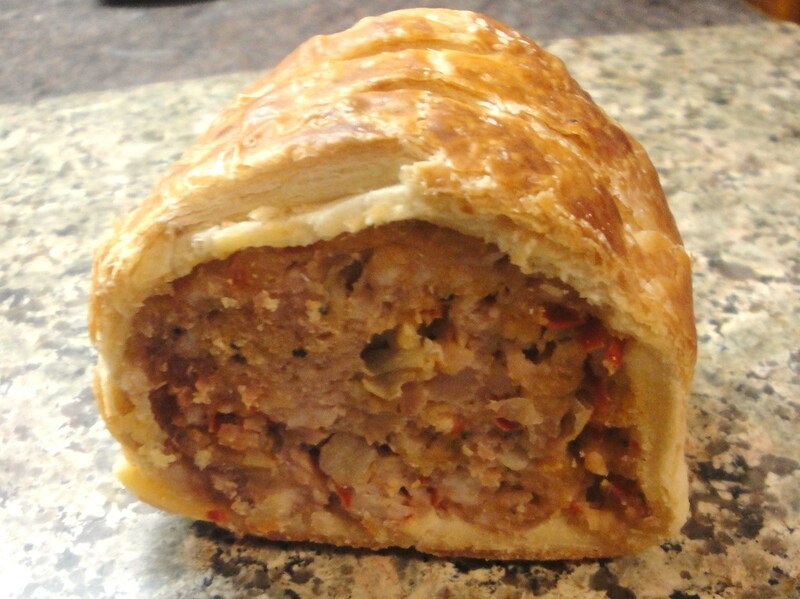 There were two options available, a more traditional herb spiced pork sausage roll, and the slightly more interesting option of one filled with Pork and Chilli. 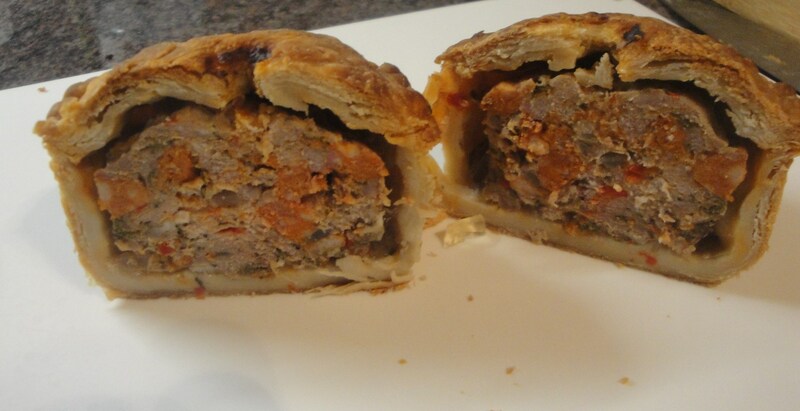 I went for the Pork and Chilli option and this was another great bit of bakery with some excellent pastry, the star of the roll was the filling, a firm solid meaty bite with each mouthful. The addition of the chilli, which you could see flaked throughout each slice, added a nice little bit of heat to the roll. Really very good indeed, and some of the best local baking I have been treated to in the South of the County. 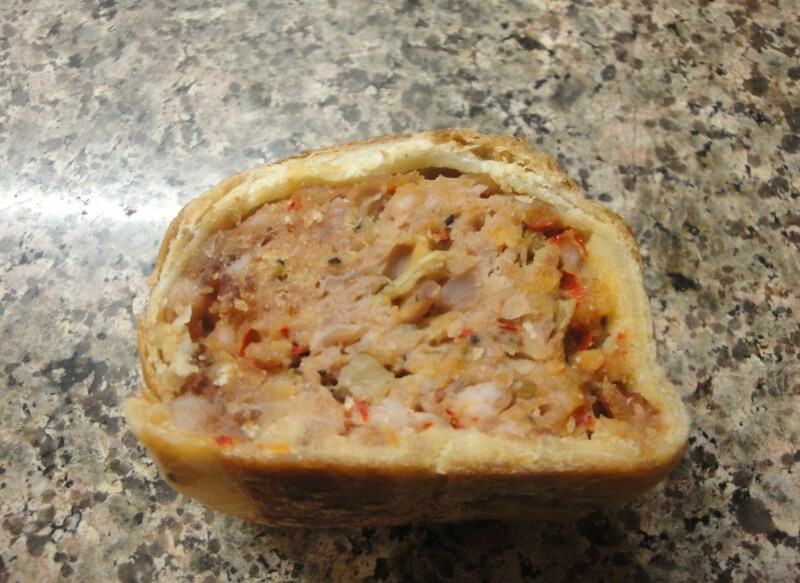 Another one of the baked items I have sampled at Matthews was one of their Pork, Chorizo, and Pepper Pies. This was another tremendous baking effort. 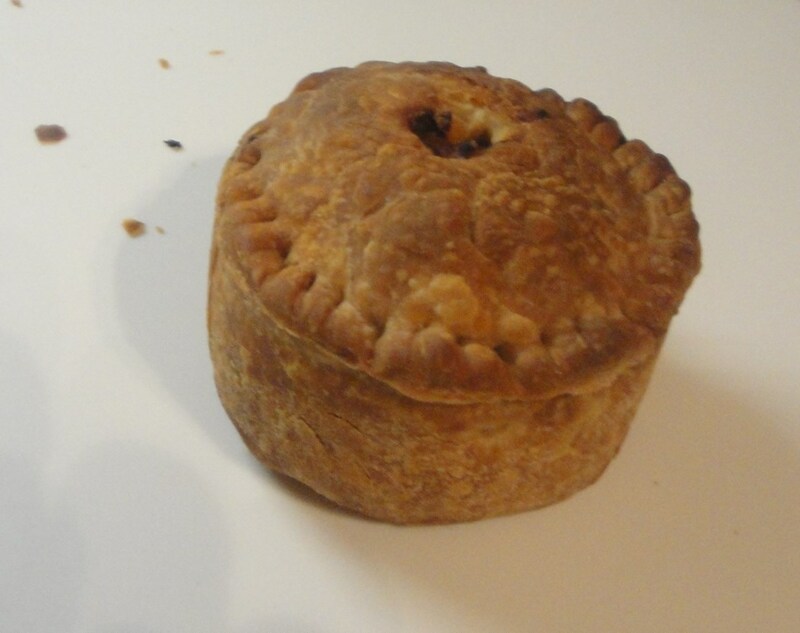 I had no fault with this pie, the pastry was firm, flaky edged and tasty. The filling of pork mixed with chunks of chorizo was a great combination. The herb flavoured pork , mixed with the tangy spicy chorizo sausage was almost perfect, the perfection was achieved with the addition of the sweetness from the fresh red pepper added to the mix. On the one occasion that I have been into Matthew’s and not had the Roast Pork sandwiches I had one of their house favourites which is the “Chicken Tikka with cucumber & mint yoghurt” for £3.90 (eat in price). It came with a small side salad garnish and a small cup of ‘split pea, ham and mint’ soup (the daily special). The chicken tikka filling was really nice and had a decent amount of heat from the spice and some good quality sized chunks of chicken. the mint yogurt was needed just to cool the tongue down a little from the spice. The bread was a bit too thickly cut to be honest for my personal preference, I think on another occasion I would get this filling in a cob or a roll (which was a option). The soup was excellent well seasoned, good flavour from all three of the main components and a nice chewy texture element when you got a piece of the ham in a mouthful. The only mild downside is that I have to confess that I had to ask what the soup was, as I couldn’t tell when I was eating it. I actually thought that it was chicken. I think that the mint confused me. 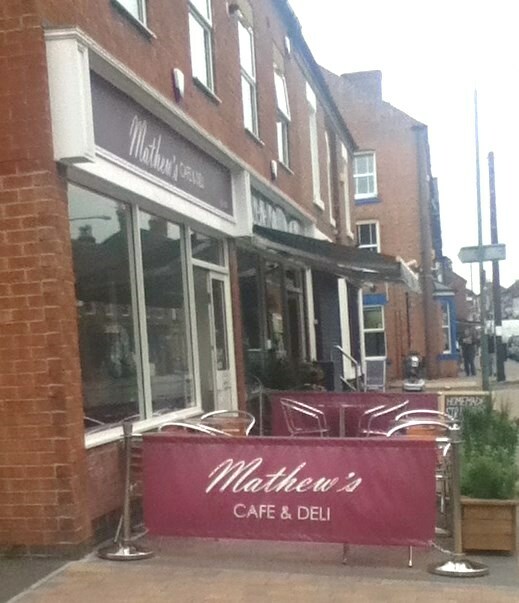 I have really enjoyed everything that I have sampled so far at Matthew’s Deli and Café in Ruddington and I am looking forward to trying some more of their excellent fare. 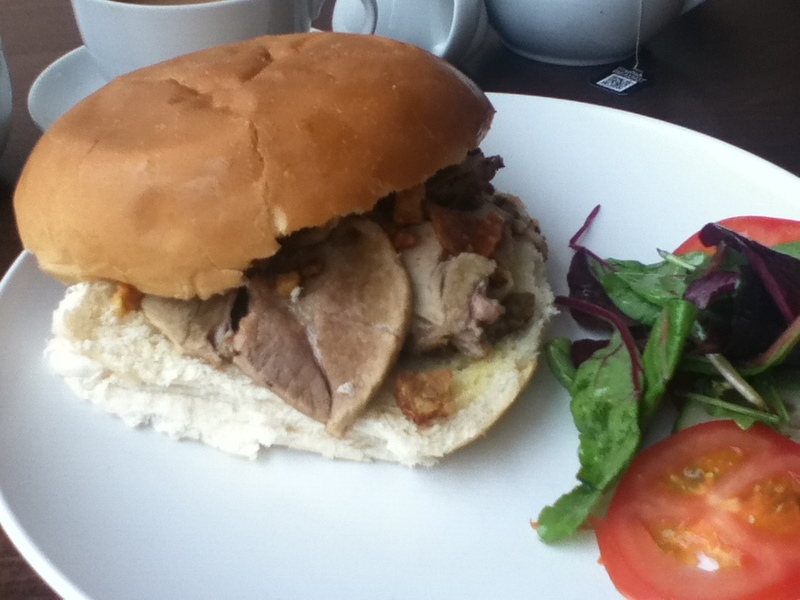 I am especially impressed with that Roast Pork Cob that they make, it is going to make it tough to order ones somewhere else now.